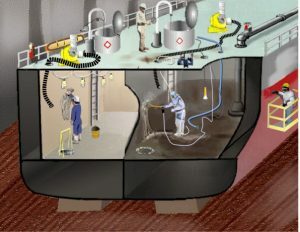 Ships can contain a variety of confined and enclosed spaces. General industry locations may share some of these characteristics, specifically the effect which work activities in one space can have on adjacent spaces. There have been a variety of instances in general industry where hot work in one space or area has caused fires or explosions in adjacent spaces which is a situation not well-addressed by the general industry rules. (The Chemical Safety Board has a number of good videos illustrating the dangers of hot work). That being said, here are the main differences between the shipyard and general industry rules. While most of the definitions are similar to general industry, there are a few differences. Adjacent Spaces are defined and include those spaces that border, in any way, a space next to it. This includes corners and diagonals. Coast Guard Authorized Person is someone who takes the place of a Marine Chemist when a certified Marine Chemist is not available. This individual is competent and designated to conduct the visual inspection, atmospheric testing, and overall hazard assessment before the start of hot work. Marine Chemist is someone who has been certified by the National Fire Protection Association. Oxygen-enriched Atmosphere is defined as being greater thean 22% oxygen. General industry uses 23.5% as the threshold. Visual Inspection of spaces and adjacent spaces is intended to identify hazards including those posed by accessibility issues, residues, unguarded machinery, and piping/electrical systems. This standard requires a variety of labels and signs referenced by this standard. These signs must be in a language that workers can understand. Enter with Restrictions: This denotes a space that can be entered if the engineering controls, PPE, time limits, and other constraints identified by the Marine Chemist or other competent person are in place. Safe for Workers: These spaces have the right oxygen content (19.5% to 22%), an LEL less than 10%, and toxins within allowable limits. In addition, the work activities have been analyzed by a CIH, Marine Chemist or competent person and have been deemed to not pose hazards. If these conditions are not present, then a "Not Safe for Workers" sign is posted. Safe for Hot Work: These spaces have less than 22% oxygen, less than 10% LEL, and the residues or contents will not create hazards as a result of the hot work. In addition, adjacent spaces have been inspected and cleaned, inerted, or treated to prevent the spread of fire. If these conditions are not present, then a "Not Safe for Hot Work" sign is posted. In some situations large areas might be posted as opposed to individual spaces within those areas. The shipyard standard places a lot of emphasis on atmospheric testing and the order of testing (oxygen then flammables then toxins). There are separate sections for testing each of these in the space to be entered and adjacent spaces. Contain or have contained flammables. Contain materials that may produce an oxygen deficient environment. Interestingly, if there is a chance that employees may be exposed to substances that do not have a Permissable Exposure Limit, the employer only needs to keep the levels below the IDLH levels (and provide suitable PPE). There is no mention of the Recommended Exposure Limt or the Threshold Limit Value which would guide our actions in general industry. These sections would appear very familiar to anyone who has reviewed the general industry regulations. The training criteria applies to entrants (there are no attendants in shipyards). The entrant's responsibilities and training certification are similar to general industry. The rescue team requirements for shipyard confined space are shorter but esentially identical to general industry requirements. 1915.13(b) requires the following before cold work or cleaning is performed. Residues of hazardous materials to be removed as much as practical (and not dumped overboard or onto the surrounding work areas). Testing and a visual inspection of the space is conducted by a competent person. Continuous ventilation is provided and testing conducted as necessary to ensure that safe for work conditions are maintained. The shipyard confined space standard does require the competent person to conduct periodic tests of ventilator discharge areas to ensure a hazard is not being created, which is a good practice for every location. Spaces that have contained flammable/combustible materials must have signs that prohibit sources of ignition at the entrance to the space, in adjacent spaces, and in the open area adjacent to those spaces. Finally, ventilation equipment must not create a source of ignition. Spaces and adjacent spaces that contain or contained flammable/combustible materials. Fuel tanks and their adjacent spaces. Pipelines, heating coils, pump fittings or other equipment connected to spaces that contained fuel or combustibles. There are some exceptions listed for certain types of vessels if the flammable material (in the adjacent tank) has a flash point of less than 150 degrees F and the hotwork is at least 25 feet away. Landside confined or enclosed spaces. Preventing Hazardous Materials from Entering: The standard references positive means of isolating the space from piped in materials including disconnecting, blanking or blocking which is similar to the general industry standard. Alteration of Existing Conditions: This section addresses the dynamic nature of confined space hazards and requires work to be stopped and the space retested and evaluated if conditions arise that pose hazards. Tests (and Changes) to Maintain the Certified Conditions: Similar to general industry requirements, atmospheric tests must be conducted as needed to maintain safety and if the atmosphere does not meet quality standards new testing and evaluation is required. Like the general industry (and construction rules) the intent of the shipyard confined space standard is the same: Protect workers from the hazards associated with confined and enclosed spaces. The main difference is in the emphasis on adjacent spaces and the wide range of confined spaces found on ships. Given the complexity of interactions and connections between spaces and the possible wide varieties of hazardous cargos, it makes sense to ensure that the persons doing the inspections and evaluations have the capabilities of dealing with all these issues. The shipyard confined space standard appears to meet this goal. © 2019 D2000 Safety. All Rights Reserved.